Habitat: It grows wild along the edges of rivers and fences in the home in the mountains. 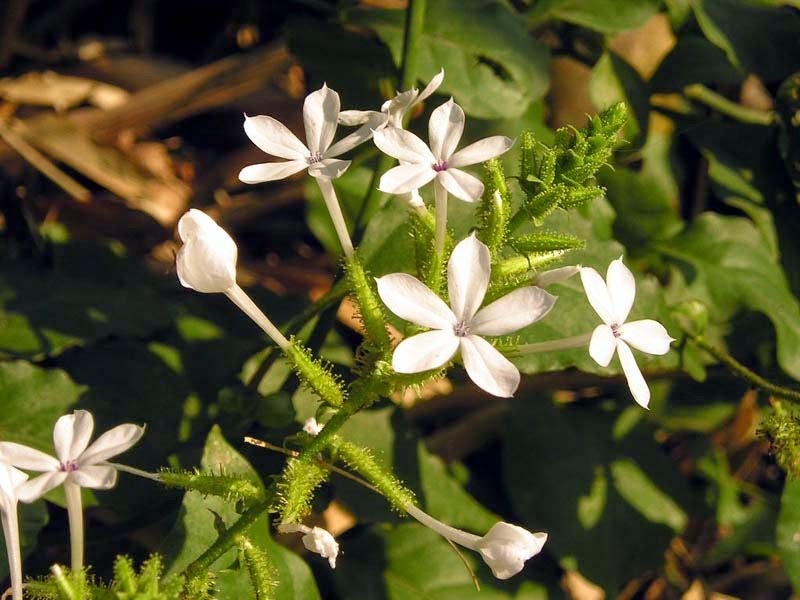 Latin Name: Plumbago zeylanica L.
Description of the plant: Plant soft-trunked shrub, and grows berumpun. Shape ovate leaves, white flowers in bunches. Small elongated fruit with a rough coat adhesive, green light time. Daun encok leaves 5 ​​pieces; 1 handful of leaves pike; Tikel balung (Vitis quandrangularis) 3 sections; 3 pieces of kecubung (Datura metel) leaves, all ingredients finely ground and soaked in 70 percent alcohol gondopuro oil* and lemongrass oil (with a ratio of 3:2:1) or alcohol 150 cc; gondopuro 110 cc; lemongrass oil 50 cc, Soaked then applied to the sore spot. *gondopuro oil is a traditional indonesian leaf oil, made from Gaultheria punctata ussually used for herbal medicines.